911 Restoration Metro East aims to make your home safe and comfortable for you and your family through our top notch water damage repair and restoration services. Bad weather, plumbing issues, and sewage backups can all be causes for leaks to start forming. Fortunately, our water damage Maryville technicians are always ready to provide you with on the day service that will get your home back in shape in no time. If any of these issues are plaguing your home, you can rest assured that our water damage Maryville pros will act immediately to ensure your property gets a fresh start as soon as possible. Whenever water emergencies occur, expect our team to be there within 45 minutes of your call. 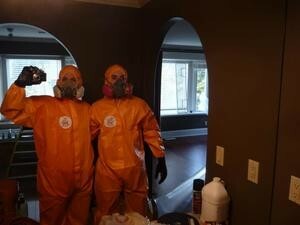 With our almost immediate response, we can help you avoid any further harm to your home such as wood rot or mold growth. One of the major water emergencies that can affect your home is sewage backups. This problem can lead to flooding, structural damage, and can have an ill effect on your health because of the biological waste carried by sewage. Our water damage Maryville specialists have regularly dealt with these kinds of problems and know how to best restore your home. We will provide you with a free inspection and estimate so we can better understand the scope of the problem and provide you with most affordable price. Our licensed, insured, and bonded water damage Maryville specialists will provide the necessary plumbing repairs. 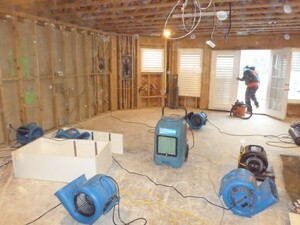 We will be making use of our advanced drying equipment to remove all traces of sewage from your home. Our IICRC certified technicians will provide the restorations that will make the affected areas of your home look good as new! Whatever the water disaster plaguing your home, you can rest assured that water damage Maryville pros will provide the highest level of quality when it comes to water damage repair and restoration. Whether you need the roof or pipes patched in the middle of the night, or if you need sewage extracted at the break of dawn, water damage Maryville experts will always be there to provide the best solutions. When you notice a leak at home, let 911 Restoration patch it up! Give us a call today!